We will learn to create iBots (Agents) using webservices in this article. Let us see the process. 1. 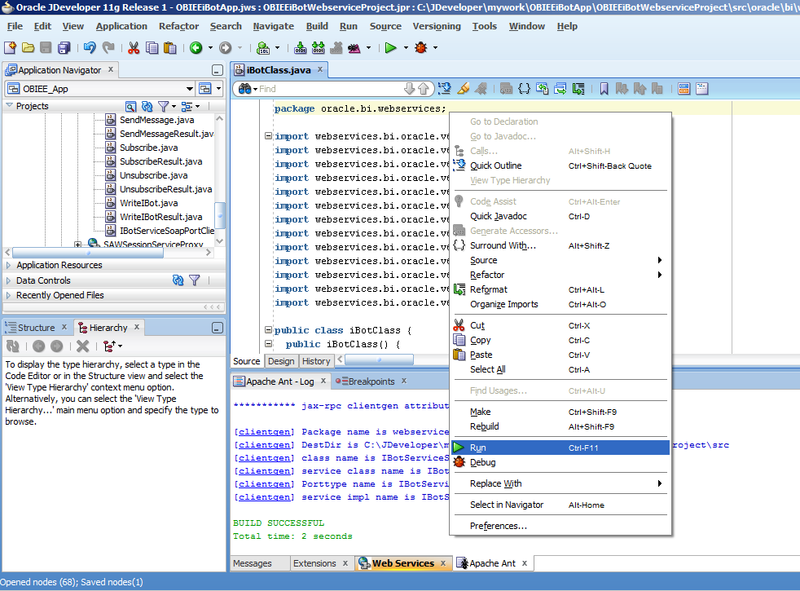 Open JDeveloper and hit the Create button to create a Generic Application as shown below. 2. I call it OBIEEiBotApp. 3. Create a Project in this Application, as shown below. Do not select anything in the shuttle. 4. Right click on the newly created project and select Web Service Proxy. 6. 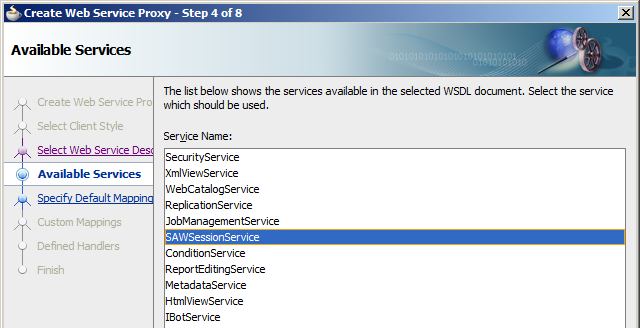 Select SAWSessionService in step 4 of the wizard and click the Finish button. This service will help us to create an OBIEE session which can then be used with any operation using Webservice. 7. Repeat steps 4 to 6 but select IBotService in step 6 instead of SAWSessionService. We are selecting the IBotService because we plan to create iBots using Webservices in this article. 8. Right click on oracle.bi.webservices and click the New... button. 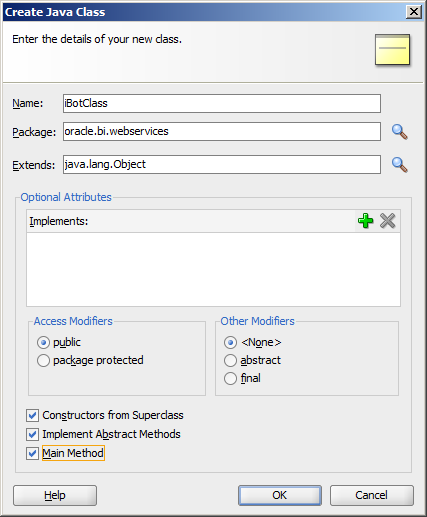 Create a new Java Class as shown below. 9. Give a name to your class, make the selections as shown in the screenshot below and click OK.
10. Your class will look like the following. You may remove the statement that creates an iBotClass object as we don't really need this. You won't get an error even if this statement isn't removed. 11. Now, we need a few classes for our code so we are going to import them. Put the following import statements right after the package statement. 12. We now have to create a OBIEE session so we create a Logon object and pass it to a SAWSessionServiceSoapPortClient object. The following code does this for us. Put this code in the main method of your class. Code from this point on will go in the main method only. Dont forget to put replace your username, password, webserver ip and port in the following code. 13. We now have to create our iBot. To achieve this, we first have to create an object of IBotServiceSoapPortClient class and then call the necessary functions to define the various properties of our iBot. We will need the following classes for this operation. a. WriteIBot class :- To set the session id, catalogobject and other such properties. c. ItemInfo class :- To set the caption, creator, last modifier etc. d. ItemInfoType class :- Required as an arguement to ItemInfo.setType method. f. Account class :- Object of this class defines a OBIEE account that does the necessary operation. Let us now look at the code. The entire code will follow the code written in step 12 above. While the rest of the code is intuitive, I wish to talk about the argument of catObj.setCatalogObject method. This argument is more or less the definition of our iBot object. Have a look at the screenshot below. Let me also share a screenshot of the typical ibot to draw a comparison between the XML and the iBot feature on the OBIEE portal. The XML arguement starts with declaring some namespaces. This is followed by the <saw:ibot> tag at the top. It is important to note that the tags in the XML closely correlate the tabs in the screenshot of a typical iBot. For example, <saw:ibot> tag is followed by <saw:schedule> tag to set the schedule of the iBot. The screenshot shows a Schedule tab as well. This Schedule tab is used for scheduling the iBot through the OBIEE portal. Similarly, we also have <cond:condition>, <saw:deliveryDestinations>, <saw:recipients>. These perform similar functions as their corresponding tabs. We can now right click on the class we just created and then select the Run button. You will get the following result. Check the highlighted part of the bottom of the screenshot below. 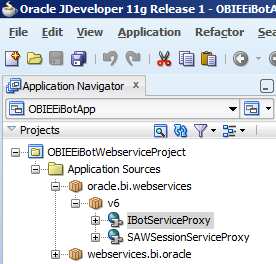 It shows the OBIEE session id which was used to create the ibot and the result stored in ibotResult object. You can now login to the screen and find your iBot. Nice documentation.. Easy to understand.. i got one error while following ur steps. can't able to resolve. host name and port numbers were correct. Thanks for the comments. The error looks to be with the expiry of your session. Check the server settings. Thanks a lot, great tutorial, works fine on obiee 11g ! You can only do the operations that OBIEE web services let you perform. Check the documentation to find a method that let you do the task you want to do. Great document thanks a lot for it. I am Ashwin from Hyderabad, India. I am also an OBIEE&Informatica developer. 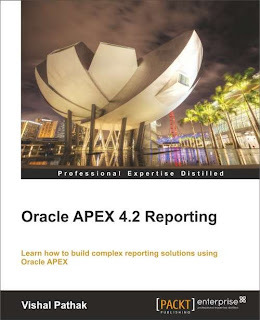 Could you please let me know your email address so that I can send you few issues which we do have in BI Publisher and OBIEE. If you can also provide your contact number that would be great.